Three-time Grammy nominee Eddie Adcock has charmed all kinds of crowds across the U. S., Canada and Europe with his bluegrass and acoustic country music, with rave reviews, much press and heavy airplay around the world. He was married in 1976 and now makes his home in Nashville, Tennessee with his wife Martha. Cashbox Magazine calls him "a stellar musician and vocalist," and Billboard has called him "one of the Bluegrass circuit's top acts." He has taken his warm, witty, high-energy music from clubs to the Kennedy Center. Eddie Adcock has appeared on "Austin City Limits," TNN's "Nashville Now" and "Wild Horse Saloon," NPR specials, and a host of syndicated and local TV and radio shows. His video, Dog, attained airplay on TNN, CMT, and even CNN. He released a number of popular recordings, appearing on several bluegrass and country charts. Eddie features much of his own original music, both songs and instrumentals, showcasing his strong, expressive style and somehow sounding like more than himself. Woven in and among his uniquely-styled music are influences from bluegrass, country, folk, jazz, blues, rock, gospel, and rockabilly, transcending into a unique and heady sound, part of the past, present, and definitely the future. And his warm yet edgy style, uninhibited stage persona is a real treat. Eddie's zany stage humor might at first belie the fact that he is an influential, innovative stylist on guitar and banjo--plain and simple: a superpicker. He has been one of Bluegrass music's best known and most revolutionary performers for over forty years. Country Music Magazine calls Eddie Adcock's playing and instrumental influence "legendary." Seen as the originator of a recognized style of playing, he was the first internationally-acclaimed 5-string bluegrass banjoist to appear at Carnegie Hall--as sparkplug in the Country Gentlemen. During Eddie's 12-year tenure with them from 1958 to 1970, they were the group who changed bluegrass and took it uptown. In his early days, Eddie was a member of Bill Monroe's Bluegrass Boys, remembered by Bill as being his favorite baritone singer. 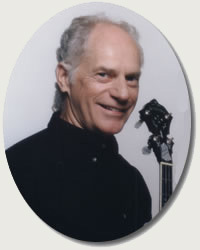 Eddie Adcock belongs to a number of business organizations, including IBMA and the Folk Alliance. He has served on the Board of Directors of the Tennessee Banjo Institute. He also runs Adcock Audio, a large, state-of-the-art sound company. And he maintains a large mailing list in order to stay in touch with deejays, press, and fans. Combining authentic Travis style fingerpicking with lightning fast bluegrass runs, Eddie gets as exciting a guitar sound as you'll hear anywhere and he breaks it all down for you note for note in this exciting DVD lesson! You'll learn Eddie's superb solo guitar arrangements of "Under the Double Eagle, Redwing, Sugar Foot Rag, Strolling, and Eddie in The High Ground". Techniques include right hand banjo rolls, complex slides, pull-offs and hammer-ons, alternating thumb/index finger combinations and much, much more!